Fiat is keen for its Doblo Cargo van to realise its potential. Jonathan Crouch reports. These days, compact vans come in all shapes and sizes and, like its main rivals, Fiat can offer you plenty of choice, the smallest option being its Fiorino model, which can take up to 2.8m3. 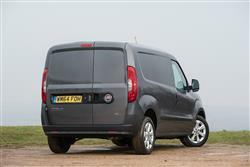 But versatile though that LCV may be, there's sometimes no substitute for space. The problem is, in pursuing that, you don't want to end up with an LCV so big that it's unwieldy around town and costly to run. 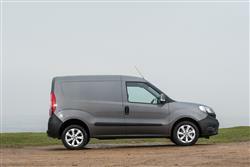 The solution, says the Italian brand, is this van here, an improved version of the second generation Doblo Cargo. 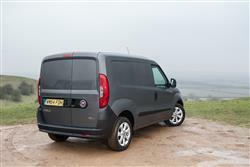 The original curiously-styled version of this vehicle offered little you couldn't get elsewhere from Citroen Berlingo and Peugeot Partner-class vehicles, nor did it have the kind of high-roof, extended wheelbase option that would make it a realistic compact alternative to something Transit-sized. 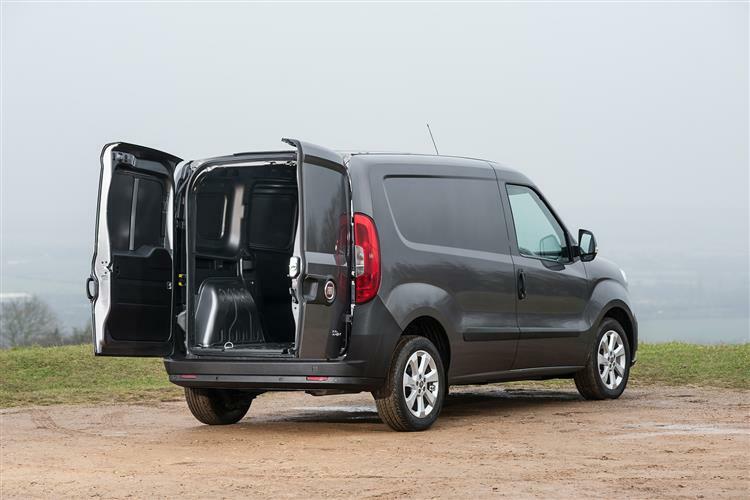 All that was put right with a second generation model we first saw in 2010, a vehicle that was 95% all new and which instantly beat most of its contemporaries in payload, load volume and running costs - in other words, all the things that really matter. Not too long ago, this model was updated, with smarter styling and the option of ultra-efficient 'Eco-Jet' engine derivatives. Sounds promising. Predictably from a manufacturer that pioneered the common-rail diesel technology that now dominates the engine bays of our top commercial vehicles, Fiat has given the Doblo a strong range of engines. There are Multijet common-rail diesels in 1.3, 1.6 and 2.0-litre guises while the few buyers who insist on petrol can go for a 1.4-litre 16-valve unit. The 1.3-litre Multijet II oil-burner has 95bhp and the 1.6 Multijet II unit ups the torque output to 105bhp - or 90bhp if you choose the 'Comfort-Matic' automatic version. Finally, the 2.0-litre Multijet flagship has 135bhp with a meaty 320Nm of torque, which is a serious amount of muscle for a compact van. With this revised model, the cornerstone 1.3-litre and 1.6-litre turbo-diesel engines benefit from enhanced responsiveness - more torque from lower revs - and improved efficiency of up to 12 percent. In the case of the 1.3-litre MultiJet II engine, for example, this responsiveness has increased by approximately 40 percent compared to the model it replaced, resulting in greater flexibility for more relaxed and efficient driving as well as livelier performance when circumstances demand. 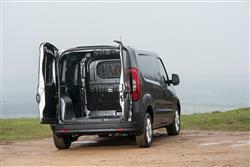 Most compact vans have a heavy duty torsen beam but the Doblo goes for a transverse linkage hinged from a central anchor point. It means operators can expect a little extra finesse from this Fiat over the bumps. This improved Doblo Cargo model also benefits from a complete redesign in line with the more muscular design language first seen on Fiat's improved large Ducato van. The sculpted bonnet and distinctive restyled headlamps combine with the bolder grille, a revised front bumper, lower air intakes and restyled fog light shrouds, while at the rear, sleeker light clusters round out the Doblo's aesthetic revisions. Inside, the interior remains unchanged, benefitting from ample storage space, high comfort and specification levels and an ability to shrug off the rigours of daily use with ease. Responding to customer feedback, this Doblo benefits from a lighter and more fluid clutch action coupled with a shorter and more positive gear change, while additional soundproofing has resulted in an average reduction of 3dB in the cabin. 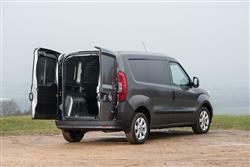 For a compact van, the Doblo Cargo has a wide model range. There are four bodystyles, two wheelbases and two roof heights giving rise to load volumes ranging from 3.4 to 4.2 square meters. Some will want to look at the Combi versions with their second row of seats. Or the platform cab variant that can be fitted with all manner of aftermarket modifications. You can even get a high roof XL version with a one tonne payload and a load capacity of five cubic metres. The range offers five engines, ranging from 90 to 135hp, and four trim levels are available: Standard, EcoJet, SX and Tecnico. Standard features on all Doblo models include adjustable-level headlamps, a full-size spare wheel, full bulkhead, overhead storage, electric windows, central locking, full wheel trims, side rubbing strips, full-height twin panelled rear doors, offside sliding side door, (plus a nearside sliding side door on Maxi and XL models) and a speed limiter (upon request). The EcoJet version adds smart alternator management, variable displacement oil pump, Start & Stop, low-friction oil, and low-rolling resistance tyres and a new aerodynamic pack. Fresh options include a clever Gateway module for vehicle telematics, a power folding door mirror function, DAB preparation for aftermarket audio systems and the Traction+ system which has already proved itself in the Fiorino and Ducato models. Traction+ enables drivers to make sure-footed progress even on low-grip surfaces, such as snow or mud, without increasing the weight of the vehicle, thereby avoiding the increased running costs associated with full 4x4 systems. Some small vans neglect storage capacity in the quest for more cabin and load space but the Doblo Cargo fares reasonably well here. There's a large shelf above the windscreen and a lockable glovebox with space for a smallish laptop computer. The door pockets will each take a couple of small drinks bottles and a document clip can be assigned to the dashboard from the options list. Out back, you've a choice of loading capacities that can be anything from 3.4 to 5.0m2, depending on the model you choose. And payloads of between 750kgs and one tonne. 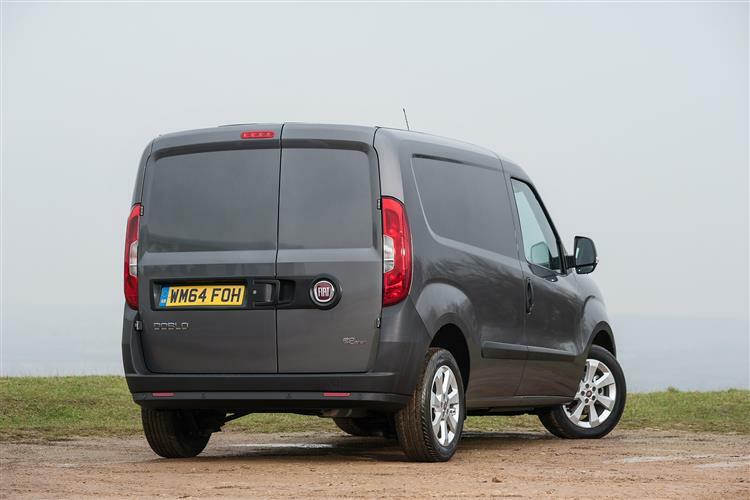 It was about time that Fiat completed its range of compact vans with a genuinely competitive contender - and this improved second generation Doblo Cargo is exactly that. 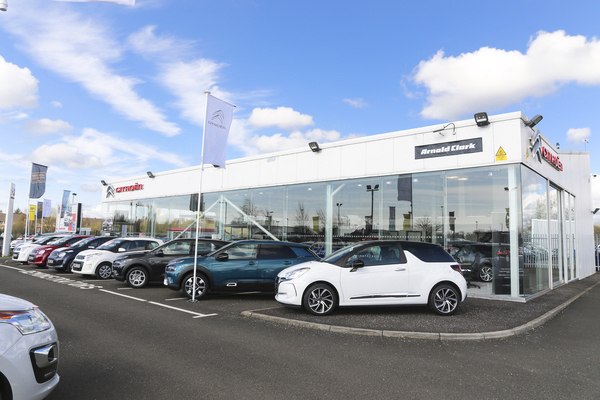 With the excellent Fiat diesel engine range put fully to work, running costs are low, while short and long wheelbase options with two roof height choices mean practicality levels are high. And this LCV is properly Italian when it comes to more tactile things like the great-looking interior and the sharp styling. 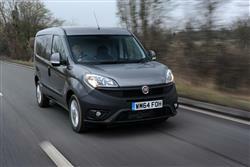 As a result of all this, there's little doubt that this van will certainly grow Fiat's business. Try one and you might well feel that it'll grow yours too.